After living full time in our RV for a month, we realized that in general, tiny living really wasn’t that hard! However, the one area I had frustrations with was the kitchen. We immediately realized we needed to get creative with better storage solutions. 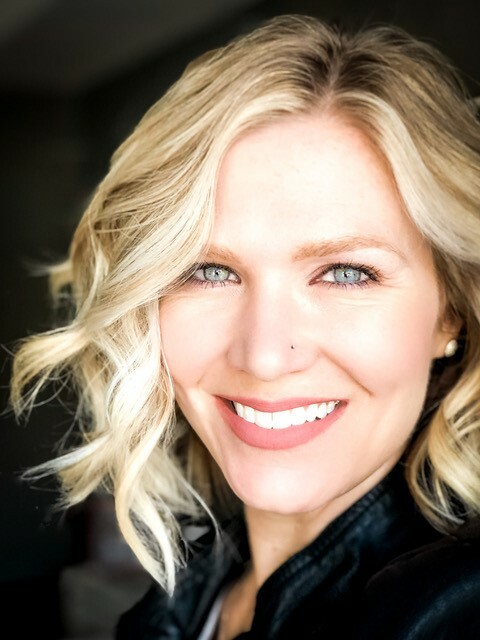 I’m going to share five items we purchased that made a huge impact on our organization and made living in the RV easier and much more pleasant! They come in strips of four, but only three fit inside my cabinet doors, so I was able to easily snap off the fourth one in order to make them work for my space, which was nice. Thirty-six come in a pack, which is great, since I have so many spices! Now my spices are much more accessible, and this one change alone makes cooking in a tiny kitchen more enjoyable! Our RV kitchen only has one real drawer, and that means a lot of random things get stuck in that drawer! Thinking it would be fine, I had sectioned it off with plastic caddies to be more organized. But it was still a pain to get to the things we use on a regular basis out easily, like silverware! Ikea makes some simple buckets that can mount on a wall with a metal rod, and we had the empty wall space to put it on, making this an obvious choice. Three buckets fit nicely on the 22.5” rod, so we use one for silverware, one for kitchen devices (scissors, can opener, etc.) and to make it look a little nicer, we put a cute succulent in the middle bucket! The buckets and the hardware come in multiple colors/finishes, so you can customize the look to fit your taste. There are also different sized rods, which allows you to pick the size that best fits your needs. Since we only have one drawer, boxes of things like baggies, cling wrap and foil were just tossed under the kitchen sink. This became frustrating, because sometimes I would toss a little too hard and those boxes would end up in the very back of the cabinet and get buried under other things and be super difficult to find when I need them! In my search for a better solution, I found an organizer that mounts to the inside of a cabinet. This was a perfect solution! Now, all I have to do is open the bottom cabinet under the sink, and VOILA! There are my baggies, wraps and foils! Since counter space is scarce in an RV, I wanted to eliminate random things that I would find lying around that created clutter. The outlet at the end of the island seems to be the popular spot for charging phones and devices, which means those devices are taking up the counter space while charging! I need every inch of counter space when I’m trying to cook a meal. Worrying about spilling something on an expensive device that was laying around was an issue I needed a solution for. 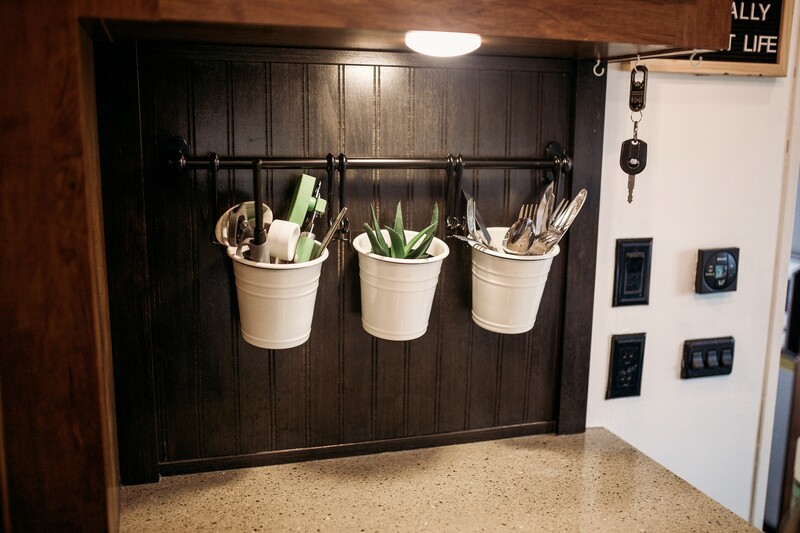 I found a wall-mountable wire storage basket that exactly fit the bill of what I was looking for. 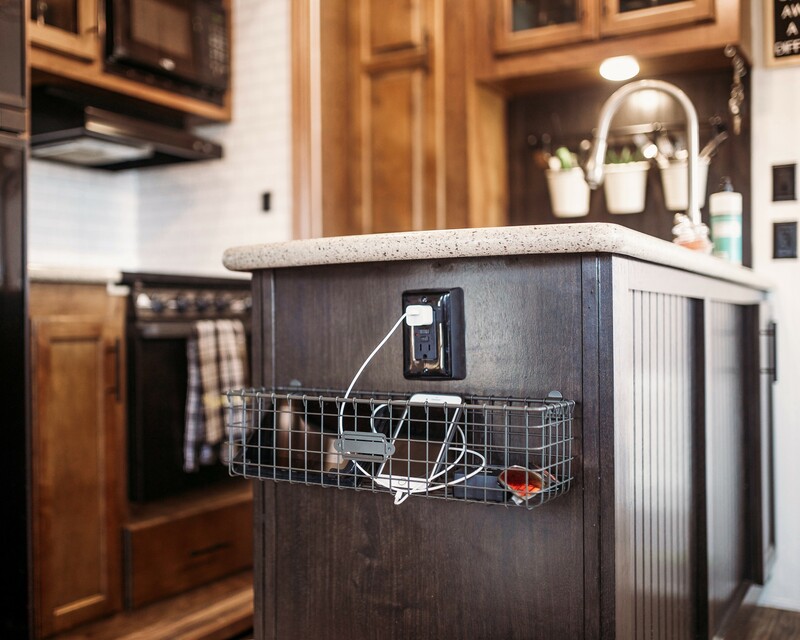 I attached it to the end of the island, so that when a device is charging, it can be placed in the basket instead of on the counter. It’s also a great place to store chargers, remotes, or other random things that I don’t want laying around! Since it’s wire, it’s easy to see what is inside. So, the smaller items we used to misplace all the time have a home and are easy to find! Most of our RV cabinets are not very deep but are tall. I realized we weren’t making the most of our cabinet space and could do better with the space we did have. 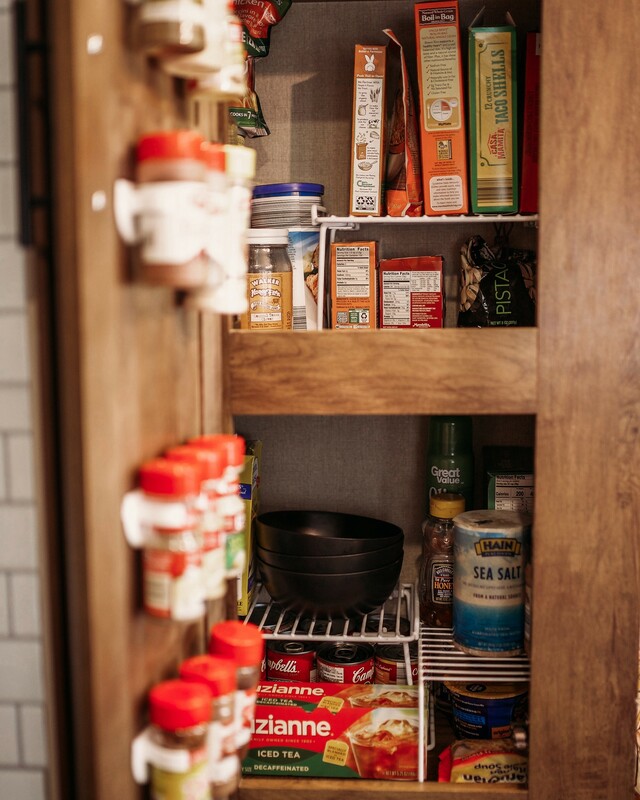 By adding shelf racks to every cabinet in our kitchen, we basically doubled our usable cabinet space! You can find these racks almost anywhere. Walmart, Amazon, Bed, Bath and Beyond… I’ve even seen them at The Dollar Tree before for A DOLLAR!!! You can’t beat that! 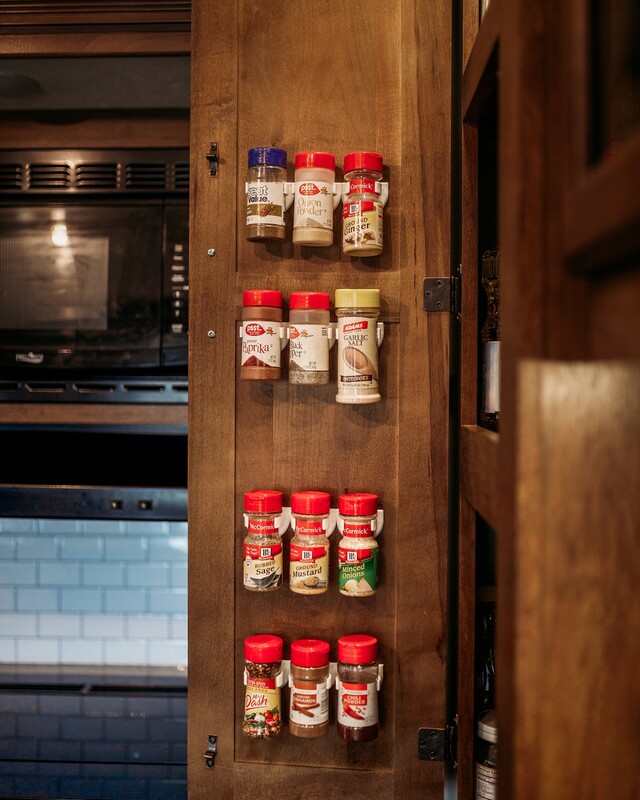 Adding these simple storage solutions in our RV kitchen has made cooking, baking and just LIVING in our RV much more enjoyable! I hope you will try some of them out if you’re having similar frustrations in YOUR tiny kitchen! I ordered a Solara slide topper to install my self. I have read the instructions, viewed YouTube and have someone lined up to help. 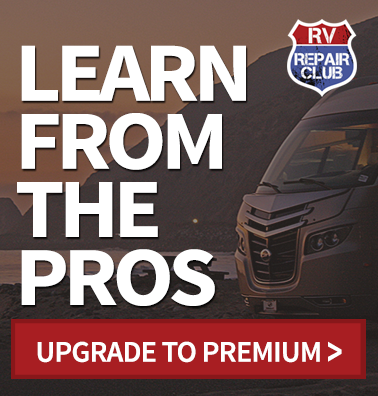 Do you have any pointers before I start. I’m a veteran DIY guy but respect an expert. When installing the brackets on the slide, make sure they grab well. Sometimes there is not much meat behind the wall and the screws can strip out. If this happens, you would have to use rivets to hold it more secure. This doesn’t happen too often, but just be prepared in case it does. Make sure to use putty tape behind everything that you screw into the wall to prevent water from entering. When the awning track is installed, widen one of the ends with a screw driver to make it easier for the fabric gimp to go into the track. Once installed run it in a out a few times to make sure it is centered before installing the gimp screw into the fabric rail, this is what holds it in place. If you experience a wrinkle in the fabric when it rolls up, pull some tension on that side of the fabric when installing the gimp screw. The extra tension will help stretch the fabric a little bit and clear the wrinkle. Also something important is to make sure the fabric rail is installed high enough to where it leaves at least a little bit of a down slope to the awning tube. You don’t want the tube to be higher than the rail, this will cause water to flow towards the wall and it collects debris. I have even seen factory installed ones come like this and it can be problematic in the future. There really isn’t too much else to do, the installs are fairly easy and it is a lot easier with some help. The storage is deep. Do I make holes screwing in stuff? I dont know for the spices. Yes when using screws it will leave holes in the walls when removing. If using the same tip for spices on the door, you have to use very small screws. It really depends on the thickness of the door but you have to make sure it won’t poke out the other side. 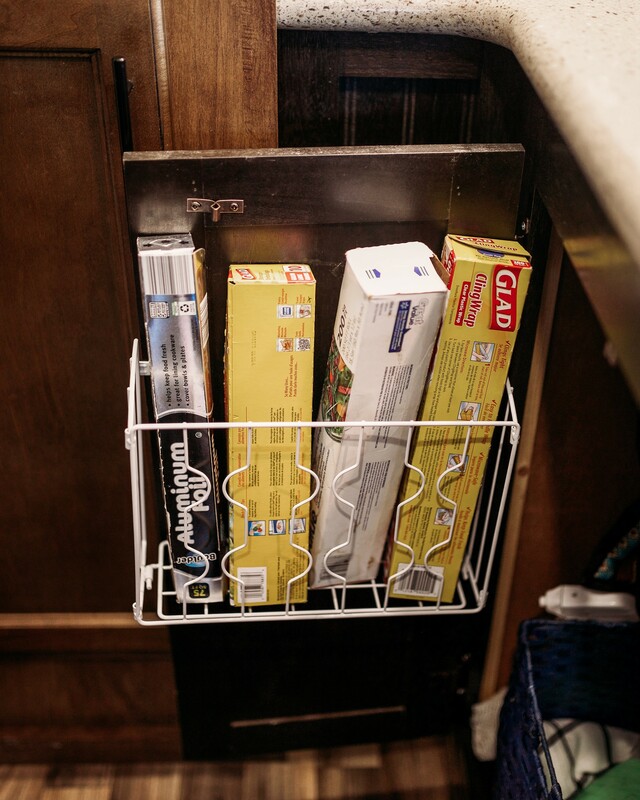 If you have deep cabinets and have trouble pulling out stuff, you can always get sliding racks to come out or storage bins to easily pull out bulk stuff instead of many single items. Great ideas where can these items be purchased? So where did you find the clips for the spice rack? There are available online at many places. Amazon carries many different styles from many manufactures. I will post a few links below to a few different ones. RV Make: Alfa see ya, RV Model: 38 foot 5th wheel, RV Year: 2007, Brand: Dometic double door, Model Number: ? Have to keep it on gas because the electric shuts down after a few days.